While this reviewer was initially quite skeptical about being “wowed” by yet another piano plug-in, we quickly learned that, in fact, Pianoteq is different. Pianoteq represents a whole new generation of technology. Advertised as a “fourth generation” piano, Pianoteq is not a sampled piano. It is a modeled piano. While many of us are familiar with modeled guitar amps, effects, and synths, this is the first physically modeled acoustic piano that we know of. Being first in anything is almost always a double-edged sword, but in this case, we feel that Pianoteq does a very good job at their goal: creating a realistic piano sound not based on sample playback, full of nuance and expression, that is relatively friendly to hard drive and CPU processing requirements. 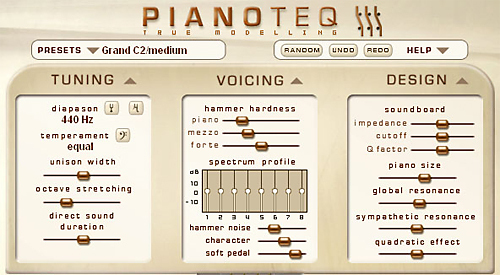 Pianoteq 2.0 is both a standalone program as well as a VST or AU plug-in available for the typical Macintosh (Universal Binary) and Windows platforms, and (happily) does not require an iLok or other hardware dongle for authorization. Just enter a serial number and authorize online when running the program for the first time. Unlike traditional sample-playback based pianos, where controls are limited to slightly modifying a sampled piano sound, Pianoteq allows for total control over the sound being produced. The graphic interface is well designed, with a host of adjustable parameters all available from within a single screen. The top half of the Pianoteq screen has three panels, each of which slide down when clicked to reveal multiple controls underneath. These panels are labeled Tuning, Voicing, and Design. Above the panels are a menu for preset piano sounds, a transport control strip for a rudimentary MIDI recorder/player, and an interesting button called Random that is just that – a button that randomly generates different parameter settings to create new piano sounds. Tuning has controls for diapason (changing the tuning of A from 440 Hz), temperament, unison width (frequency variation within each set of three strings that comprise a single key), octave stretching, and direct sound duration. Voicing has controls for hammer hardness (which will enrich higher frequencies), spectrum profile (which modifies the intensity of the first eight overtones), hammer noise, character, and soft pedal. Design has controls for the soundboard: impedance control (will yield longer sounds), cutoff (boosts higher frequencies), and Q factor (controls high frequency duration); piano size (yes, you can make a thirty-three foot (10 m) piano! ); global resonance; sympathetic resonance; and quadratic effect. The bottom half of the interface has controls for equalization and velocity (displayed in graph form to draw your own curve in), reverberation (which also tells the polyphony being “used up” at any given moment), and graphical representations of the entire keyboard and pedals that move in real-time as you are playing them, sort of like watching an unattended player piano. Finally, there is a pull down Options menu that includes MIDI choices, audio routing choices, dual core processing On/Off, and lid position choices. At the top of the screen is a pull down menu for selecting various preset pianos. While there are a number of kinds available (i.e., classic and modern), there are currently four free add-ins (to registered owners) that can be downloaded from the Pianoteq website. 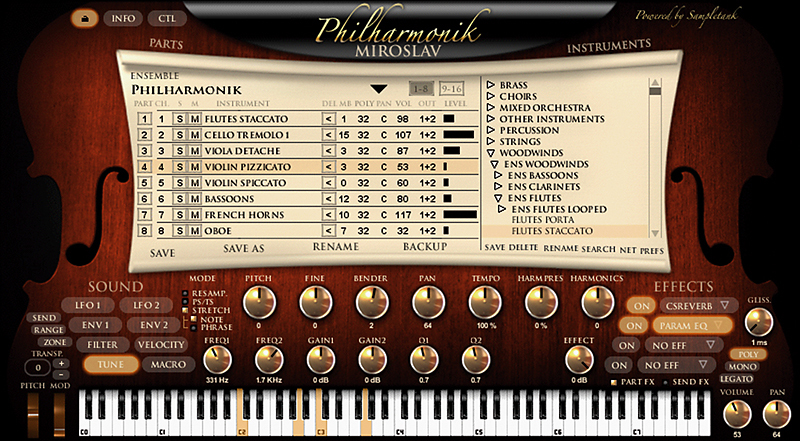 These four pianos add other piano shades to the palette, and all parameters are editable. We installed Pianoteq 2.0.1 on both an Apple Power Macintosh G5 dual 2.05 GHz and a Power Macintosh G4 dual 1.42 GHz, and tested the stand-alone version. Unfortunately, Pro Tools studios (like ours) are not yet addressed, as there currently is no RTAS version of Pianoteq (we prefer not to test VST plug-ins using VST-to-RTAS wrappers unless specifically encouraged to do so by the manufacturers). Installing the program was no problem. Our total download (not counting the optional other four pianos) was only about 12 MB. This was unexpectedly small. The actual installation literally took a matter of seconds – it was so fast we didn’t think it actually installed at first! Once launched, we entered our code, and we instantly had Pianoteq making sounds. to any of the parameters. Despite the mostly-outstanding interface, managing customized sounds needs to be handled more logically. Whether using the Random feature or customizing existing piano sounds, saving and loading these sounds was accomplished from the Options menu. It would have been more logical to load our saved sounds from the Presets menu, perhaps added beneath the list of factory pianos. When we added downloaded pianos from the Pianoteq website to the ad-ins directory/folder, upon restart, the new pianos showed up in our preset list, but saving our custom piano sounds into the same folder didn’t add them to this menu – we still had to look under the Options menu to load those sounds. One question we wrestled with was, “What is really considered enough CPU power to adequately run Pianoteq?” We found that with slower passages, Pianoteq worked well in our older G4 setup. However, with faster passages that required more polyphony, the sound became distorted and eventually completely inaudible. This was a problem even with the polyphony setting reduced to just a handful of voices and the audio resolution lowered well beneath the default setting of 44.1 KHz. As Modartt’s website states that even modest computers can run Pianoteq (“a minimum of a 1 GHz processor, but preferably a CPU less than two years old”), we did wonder what was considered in terms of real-world usability. To be fair, the first test systems was an older Mac – even a dual processor G4 is now considered two generations behind the current Intel processors (despite widespread use in many studios), so perhaps CPU hiccups were to be expected. But given the information available, we were a little surprised (and disappointed) at the performance on this system. Not to be thwarted, we then ran Pianoteq on a newer, dual processor G5 (funny how those better computers always make it to the editors’ studios first, huh?). The results on the dual G5 were much better. While on default settings of forty-eight voice polyphony and 44.1 KHz resolution it was still possible to generate distorted audio with very fast playing, it became significantly more difficult to generate artifacts. In fact, when the resolution or polyphony were lowered, the distortion disappeared altogether. Overall, on a G5, Pianoteq was extremely usable. As an aside, we found an interesting quality of the polyphony counter. For example, while holding down two notes, without any sustain pedal, the polyphony counter stated two voices being used. However, when we pressed down a third note while holding down the previously pressed two, the polyphony counter then jumped to five! Going one further, holding three notes down without sustain pedal and then adding a fourth produced a polyphony count of nine! We decided this is probably not a bug, but rather a total number of voices used to create a piano sound, and as more resonant and harmonic sounds become present, additional voices are used up. Pianos come literally in many shapes and sizes. And colors. And we don’t mean black, brown, white, or Liberace’s purple sequins. It is this very quality – the subtle (and some not so subtle) colors of a piano that give a piano its character. This is where Pianoteq excels, and, to some degree, fails. While sample-based pianos do offer quite a bit of control over your sound, you are still originating from the same sampled sound. Pianoteq allows you to control every nuance – even change the tuning between the three strings of a single key. The modification of these parameters, essentially using the principles of physics and sound generation, allows for the creation of an almost limitless number of unique piano sounds. As a musician looking for a “new” or “different” or “signature” sound, this is very cool. But how does is sound? That is, to a large degree, a matter of opinion, but hey, we’ve got plenty of opinions to share with you! All of the presets were generally good. Some had weaker basses than we liked, some lacked a little shimmer in the high end, and occasionally (but not often) there was an element of artificiality to the sound. But overall, there were definitely some very solid and convincing pianos in the group. Most importantly, these pianos felt like they all breathed their individual story, which is what one would expect from a real piano; not from a simulated one. There were a couple of whimsical touches too. Besides presets for two classic pianos (labeled C1 and C2), a modern piano (labeled M1, not to be confused with the classic KORG M1’s artificial piano sound), there is another piano preset called “pianorga” which sounded like a piano and organ fused together (and almost had a synth/organ sound quality to it). Another preset was reminiscent of a Rhodes electric piano. The Random button was a lot of fun to use. Every time we clicked it, Pianoteq created a very different piano sound, which was readily visible with all the parameters now at new settings. Despite all the ability to tweak so many parameters, we weren’t able to create a “complete” piano sound to our liking. With so many controls, one could tweak the high end for sparkle, but then the bass sounded thin. Conversely, one could create deeper bass strings, but then the higher notes didn’t sparkle as well as we would have liked. While the preset “Grand M1 jazz” had one of the best overall balances low to high, it was still difficult to coax an ideal total piano out of Pianoteq. Our ideal sound would have combined the lower registers from one piano with the higher registers of another. Given the incredible flexibility that Pianoteq offers in piano sound sculpting, we hope that future evolution of the product might give us options to combine some characteristics from one piano and blend them with those of another. Perhaps a simpler solution, though, might be to expand the capabilities of the three-band equalizer – adding a “Q” control to each of the EQ bands would enable us to more precisely tweak the overall tone of a piano. Don’t misunderstand us – there are many good sounding pianos here, and they’re typically as realistic sounding as sample-based products. We also appreciate that because each preset is built from a piano model instead of a huge multi-sample, changing presets is instantaneous – no waiting for a huge multi-sample to load into memory. The manual does a very good job of explaining piano history, explaining how a piano makes sound, and how Pianoteq accomplishes that goal. The manual clearly explains how the various controls can be altered, and it provides some tips on creating your own sounds. If only some of our other manuals were like this! 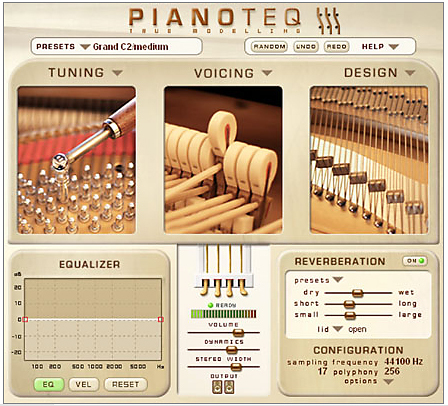 Pianoteq can be purchased direct from the Pianoteq website for 249.00 € (as of June 4, 2007, that’s around $335 USD), and may be found online for less. While there might be sample-based piano software out there that sounds stellar for a single application, few programs have the control over fine details within your sound like Pianoteq. And at the moment, there is no other program that utilizes the modeling technology pianoteq employs… and it’s only going to get better over time! While there are numerous sample-based virtual piano instruments, Pianoteq is the first modeled piano, and as such doesn't have any direct competitors at this time.